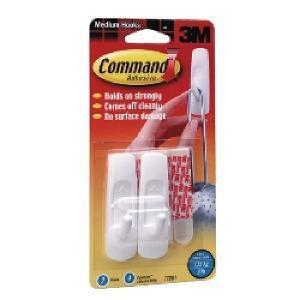 Command™ Utility Medium hook holds up to 1.3kg. Its functional design makes it perfect for organizing and hanging cords, tools, clothes and other items. Can be used in most rooms of the house including bedrooms, laundries, kitchens and hallways. Forget about nails, screws and tacks. It comes with the revolutionary Command™ Adhesive Strips so it hold strongly on a variety of smooth surfaces, including painted plasterboard walls, wood, tile and more. Yet, comes off cleanly - no holes, marks, sticky residue or stains - so you can take down and move your Command™ hooks as often as you like. Reusing them is as easy as applying one Command™ Medium White Refill Strips. Each pack contains 2 hooks and 4 strips. Do you wish you could create extra storage space, as well as have frequently used items in easy reach? Whether it's hanging, coats, keys, lanyards, calendars, tools, utensils, brooms or other items, the Command™ range of hooks can help you better organize your home or work office. Hold strong and securely in place. Damage free - no need to drill or damage surfaces. Work on a variety of surfaces. Remove cleanly if you change your mind. Hooks can be re-used with refill strips. Whether it’s a reception area or meeting room, dress up the walls with some decorative hanging pieces to create some personality. If you are hanging picture frames or certificates, we recommend using our dedicated range of Command™ Picture Hanging Strips and Hangers. Storage areas can quickly turn messy, especially if you have limited cupboard space. Command™ hooks come in a range of sizes and weight holding capacity for whatever needs hanging, be it a cleaning brush or a towel. Beyond the office, Command™ hooks can also help you be more organised at home. Here is just one idea on how to neatly organise backpacks off the ground. The possibilities are endless.